Back in Switzerland, Alfred Vogel successfully germinated these seeds, managing to cultivate his first crop of Echinacea plants in the herb gardens of his clinic in Teufen. These original plants are the forerunners of the fresh, healthy herbs we cultivate organically today for all our Echinacea products. The Echinacea herb is one of the most popular herbs used in Europe. It is considered to be the prime remedy for the immune system and this view has been supported by extensive research. The Native Americans were the first to recognise the value of the plant, using it for wound healing and snakebites. 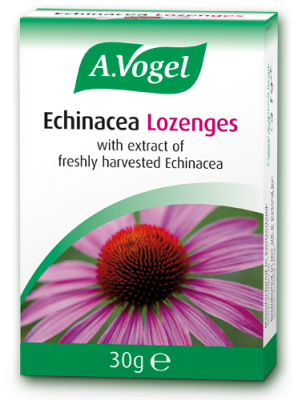 Echinacea works principally by modulating a group of cells in the immune system known as the macrophages. These cells have the ability to destroy viruses, bacteria and other particles that threaten the health of the body. The immune system thus works more efficiently at avoiding infections. If viruses and bacteria do manage to invade the body they will be dealt with more rapidly. Whilst there are two other species of Echinacea which may be found in use, tests have shown that Echinacea purpurea has the greatest activity. Additional advice: Those suffering from leukaemia or HIV should consult a Doctor before using Echinacea. Do not use if taking immunosuppressant medication. Avoid in cases of known hypersensitivity to Echinacea preparations. Glucose syrup, cane sugar, honey, herb extracts, fresh Echinacea extract (14mg), caramel sugar syrup, peppermint oil, menthol, peppermint oil, citric acid.